I am asked all the time when there is a meteor shower: “What direction do I need to look to see the meteors” and “what time”? These questions as well as many others seem to have had laboured answers in the past, but the reality is, astronomy is dead easy and you don’t need to be exact unless you are taking images or doing proper research or science. The average person with an interest in the night sky doesn’t need to know all the technical ins and outs, especially if they are doing naked eye observing without equipment like a telescope. When the average human being looks up at the sky using just their eyes, they are only capable of seeing things in an approximate position so answers to questions like “where do I look” need to be easy and not filled with statements containing phrases of a script from Star Trek. 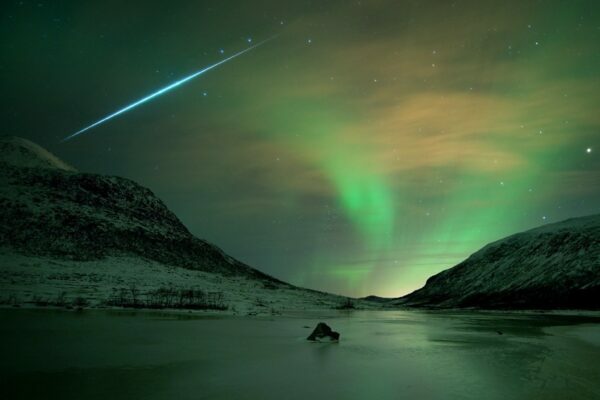 So, where do you look to see meteors from a meteor shower and what direction do I need to look? 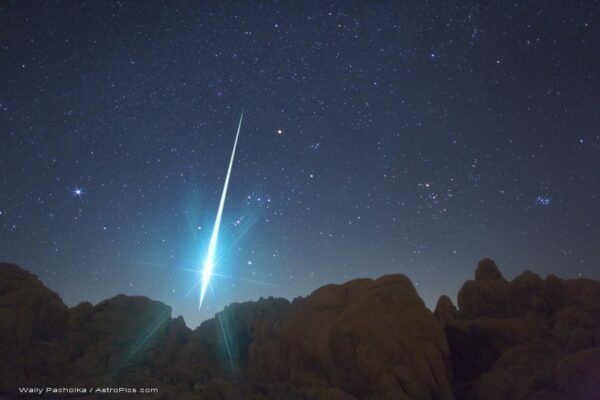 Meteor showers are not an exact science; we know roughly when they are due etc, but the great thing that makes them so exciting, is you never know when or where the next meteor will be. Meteor showers have a point in the sky where they originate from – Not appear and this point in the sky is called the radiant. The radiant and the constellation it is in, gives the meteor shower its name e.g. Geminids – Gemini, Perseids – Perseus etc. Many astronomy publications confuse people by putting a diagram of the radiant with meteors streaking out of it – It doesn’t look like this in real life, meteors will appear randomly in any part of the sky. You can trace their paths/ trails back to the point they originate from – The radiant. What time do I look to see a meteor shower? Again this is simple, but it also depends on the specific meteor shower. I personally say anytime after dark, but it gets better between midnight and dawn. The reason for this is humans in the 21st century don’t like the cold and have to go to bed and get up early and stuff. If I said “You need to be up all night until the small hours” most people wouldn’t bother. This is the perfect time many say, but during a meteor shower you can see meteors any time after dark and you can also see sporadic meteors and meteors from other showers every night of the year. The trick is to make sure you are comfortable and to give yourself plenty of time – at least half an hour or more before you go back indoors and watch TV or go to bed. With a good meteor shower like the Perseids or Geminids, you may see a meteor every few minutes; but you must keep your gaze on the sky. Blink and you miss it! Thank you for reading this and below are the simple answers to the questions at the beginning of the article. What direction do I look to see the meteors? What time do I need to look? Any time after dark. Some say around midnight through to dawn is best, but you will see meteors before this if you are patient and maybe lucky. This can be shower dependant and your location in the world etc – Look up when you can, you will see some. What is the best day to see the meteor shower?